Besides impacting domestic political issues, the death of Joseph Stalin in 1953 changed the Soviet Union’s relationship with China as Nikita Khrushchev’s ideological differences and anti-Stalinist reforms drove a wedge between the two communist neighbors. After the formation of the Chinese Communist Party in 1921, China developed a very close relationship with the Union of Soviet Socialist Republics. Mao Zedong and the CCP leadership chose to rebuild China after the Soviet model, recreating the “Stalinist version of Marxism-Leninism and its centralized economy” (Cheek 18). When China began its first 5 Year Plan in 1953, the Chinese received technological and economic assistance from the USSR, helping the newly Communist nation to industrialize. China experienced solidarity with the Soviet Union during Stalin’s regime, as both nations were led by authoritarians and had a centralized state administration. Additionaly, they exercised hegemony over the government and military, as well as purges, censorship, and forced labor (Cheek 20). Despite these similarities, the relationship between the People’s Republic of China and the Soviet Union did not retain its strength after Stalin’s death and the following reforms. 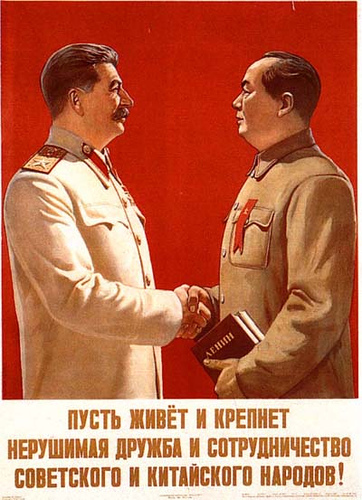 As Khrushchev rose to power, his moderate views and lack of appreciation of Stalin became increasingly clear to Mao. The future Khrushchev planned for the Soviet Union was formally described when his campaign of de-stalinization became publicly known in 1956, after his speech to the Communist Party’s Twentieth Congress was leaked. He personally attacked Stalin, calling him “a very distrustful man, sickly suspicious”, as well slandering the cult of his image, which caused the “rude violation of party democracy, sterile administration, deviations of all sorts, cover-ups of shortcomings, and varnishings of reality”. Besides resulting in unrest in western regions of the Soviet Bloc, Khrushchev’s harsh words of condemnation shocked Mao and insulted the memory of his recently departed socialist hero. This speech was the first moment in a serious events that would eventually lead to the Sino-Soviet Split. Mao was insulted by Khrushchev’s lack of appreciation for Stalin’s legacy, blaming Khrushchev for interrupting the great work of Stalin and leading the nation away from the socialist goal through his anti-Stalin reforms. In addition to the heightened, personal tension between Mao and Khrushchev, which “fatally undermined the alliance from the top down”, the USSR began to pursue détente with the United States, breaking the communist bond it held with the PRC in their stand against the Western imperialists. Overall, Khrushchev’s speech and reforms initiated an era of separation between the Soviet Union and China, eventually causing a major shift in power during the Cold War. Cheek, Timothy. “Introduction.” In Mao Zedong and China’s Revolutions: A Brief History with Documents, 18-20. Boston: Bedford/St. Martin’s, 2002. I have always been curious as to why China and the Soviet Union were not closer allies during the later years of the Cold War. It seems common in history for dictators to align themselves with other dictators, and Mao was sure to have done this in order to further legitimize his rule. If Stalin, the great socialist of his time, was seen endorsing Mao, it was sure to have struck a chord with Mao’s supporters. There are a lot of interesting comparisons to be drawn between China and Russia. In fact the crisis over the soviet revisionism was part of the backdrop to the Great Leap Forward in China, which was their first five year plan. The GLF was a dismal failure and ended around 1961 with an estimated death toll of 18 to 38 million. Thank God that alliance didn’t last! I would hate to think what may have happened during the Cold War if the USSR was allied with the PRC throughout. Very well written post. Mao was probably just mad Khrushchev didn’t have a mustache like Stalin. In reality, this was probably a super complicated relationship because both China and the USSR supported Vietnam against the American “imperialists”, despite their own disagreements. Great post! I wonder if Khrushchev would have spoken so harshly about Stalin in his speech to Congress if he’d known how China would react. If the two countries had remained friends, I wonder how different the world would be today. Honestly, I do not think we would have had much to worry about if we were engaged in war with both Russia and China. If nukes were not used, China would have lots of trouble mobilizing their army along with not receiving a lot of support from their people. If any of you remember the quote about the “Billion screaming China men” from the original Red Dawn, I think that situation would have been likely if a war had started. Copyright © 2019 Rediscovering Russia. All Rights Reserved. The Magazine Premium Theme by bavotasan.com.